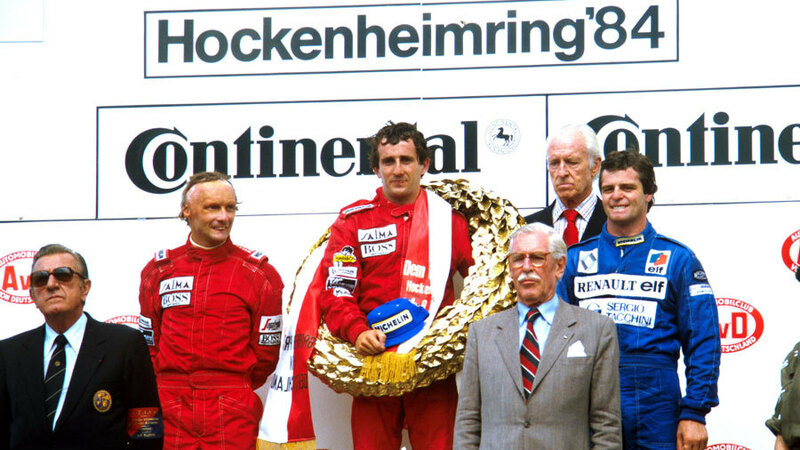 The ding-dong battle between the two McLarens continued at Hockenheim as Alain Prost recorded his fourth win of the season to extend his lead over team-mate Niki Lauda in the drivers' championship to 5½ points. Things had looked grim for Prost when a fuel pump problem which had caused him problems in practice returned during the warm-up, and he took a decision to jump into the spare McLaren even though that had been set up for Lauda. But he had the advantage of starting from pole. Elio de Angelis in a Lotus took the early lead but his car lasted only eight laps before it expired in a cloud of smoke. Prost briefly took over before Nelson Piquet in his unreliable but fast Brabham moved past. Keke Rosberg had showed promise in Dallas but again was undone by reliability as his electrics failed, and almost inevitably Piquet soon followed but he was relaxed enough to pull a fast one on the Brabham mechanics. As he arrived at his pit, he pointed to each corner of the car. The pit crew sprung into action and changed all four tyres in response to which Piquet applauded, cut the engine and hopped out of the car. Prost was back in front from Lauda and it remained that way to the end with Derek Warwick again being the best of the rest for Renault. It later emerged McLaren had decided whichever one of them led with ten laps to go would be allowed to take the win so they did not run out of fuel battling each other. The long straights at Hockenheim proved brutal on the turbos and only nine cars finished. Nigel Mansell, who was fourth after starting 16th, said: "I saw about four cars go out with blown turbos in the first few laps and decided to turn the boost right down."